Convincing people to pay for services they have been using for free is always tough. Roads are one of them. Across the country there have been protests, including some violent ones, against toll collection. More significantly, protests have erupted even on roads that have been under toll for years. In most cases the trigger is a sense that the charges are unjustified in proportion to the costs. The names of 18 persons with black money in foreign banks that the Centre has revealed in the Supreme Court are of ordinary tax evaders and do not ring alarm bells. Contrary to the practice of naming and shaming those who default bank loans, the Centre seems to be overly cautious about protecting the identity of those engaged in white collar crimes. APART from the general insanitation of Indian towns and the defects or wants of municipal arrangements for better health, there is the question of general poverty and other causes of physical unfitness that account for high mortality. It is worth ascertaining to what extent the large number of deaths from fevers and the heavy infant mortality all over India are due to other than purely sanitary defects. OVER the weekend R. M. Lodha took over as the Chief Justice of India (CJI) from P. Sathasivam, who had headed the Supreme Court with distinction but for only a short period. No wonder, therefore, that on the day of his retirement he suggested that the chief justices of the Supreme Court as well as the high courts should have a fixed tenure of two years. Interestingly, his successor disagreed and argued that the present system of the chief justices retiring on attaining the prescribed age of superannuation must continue. When the puny and timid avatar of Shahrukh Khan spouted this dialogue, a lot of us smirked with intellectual superiority at the irony inherent in the dialogue. For after all the image of a common man is a man of naivety who is powerless in the face of political shenanigans of street-smart 'netas'. But my strongly held belief in the impotence of the common man underwent a sea-change recently. It was not an intellectual forum that brought about the change but what I would diplomatically call 'kitchen politics'. Even as multiple crises on the global front challenge American diplomacy, Washington has not lost sight of Asia. US President Barack Obama's visit to Japan, South Korea, Malaysia and the Philippines is a signal that despite questions about America's staying power in the region, Washington has no intention of ceding its strategic space in the region. What is the Thucydides trap? And, how can it be avoided? This expression was coined by Graham Allison, the highly regarded Harvard academic, to describe the situation where a rising power causes fear in an established power, which escalates towards war. Thucydides had written: “What made war inevitable was the growth of Athenian power and the fear which this caused in Sparta.” An element of determinism imbues this logic leading to beliefs that a rising China will inevitably clash with the established United States while contending for the leadership of the international system. Convincing people to pay for services they have been using for free is always tough. Roads are one of them. Across the country there have been protests, including some violent ones, against toll collection. More significantly, protests have erupted even on roads that have been under toll for years. In most cases the trigger is a sense that the charges are unjustified in proportion to the costs. Infrastructure building is an expensive proposition, but key to growth. The PPP and BOT models for road building are thus inescapable. Public anger against the concept does not augur well. Under pressure, earlier in Maharashtra and now in Haryana, the state governments have offered to relook at the toll policies. That's an indication that there is scope for negotiations. The fact is there are no fixed norms for the contracts signed by various governments, which leaves scope for favouring builders. In many cases the amount collected far exceeds the investment. Often toll collection contracts are given to the highest bidder, with little correlation to the actual subsequent collections. Estimates are made, but a bit of corruption can always skew those. There have been instances of collection on roads and bridges being stopped long after the agreed periods or recoveries were over in both Haryana and Punjab, following court intervention. Reforms in this sector have to include certain benchmarks for reasonableness of profit. At present even the contracts signed are not implemented in spirit, or simply forgotten till the public forces action. Once costs are recovered, the toll has to come down to maintenance levels. To the builder and those responsible for implementing the contract conditions, delay of each day means that much more money. That is a primary reason for the bitter legal battles. Uniform policies need to be made to prevent that. The RTI law regarding PPP projects, especially where collections by private parties are concerned, is vague. It is public money collected as a virtual tax; all information on it should thus be public. The names of 18 persons with black money in foreign banks that the Centre has revealed in the Supreme Court are of ordinary tax evaders and do not ring alarm bells. Contrary to the practice of naming and shaming those who default bank loans, the Centre seems to be overly cautious about protecting the identity of those engaged in white collar crimes. People's interest may be more in those in public life and holding high positions in the government. Those who evade taxes and deposit their unaccounted money in banks abroad deserve no leniency. It seems politicians, bureaucrats and top industrialists have done no wrong, while those without political or financial clout get caught. The issue of black money may ignite passions in Parliament but is missing from the political discourse in the ongoing elections. It is common knowledge that elections are fought with black money. Large amounts of currency notes are seized, but little effort is made to follow the money trail and arrest the politicians involved. The Election Commission is either helpless or indifferent to the use of money power in elections. Debates about the state funding of election campaigns have remained inconclusive. Political parties resist attempts to either bring them under the RTI Act or monitor their funding. Even if half-heartedly, the RBI and the government are trying to curb black money. To fight the menace, the RBI recently decided to phase out certain old currency notes. The move reportedly drove unaccounted money into assets like gold, jewellery and immovable property. Finance Minister P. Chidambaram has talked of government action in 84 cases of black money abroad even though it is hard to get information about secret accounts of Indians from Swiss and other foreign banks. He has threatened action by India against Switzerland at global forums like G20, which can impose sanctions for the protection of the member countries' finances and financial systems. Obviously, successive governments have not done enough to check the circulation of black money, which incidentally is also linked to terror and drugs, two other major challenges before India. APART from the general insanitation of Indian towns and the defects or wants of municipal arrangements for better health, there is the question of general poverty and other causes of physical unfitness that account for high mortality. It is worth ascertaining to what extent the large number of deaths from fevers and the heavy infant mortality all over India are due to other than purely sanitary defects. Enquiries made in English municipal towns seem to show that there is a direct connection between the rate of mortality and natural selection. That is to say, human mortality is partially selective in its action and those who die before their natural span of life are on the whole less fit that those who survive. AT the sixth anniversary of the Punjab Hindu Sabha, a number of interesting and eloquent speeches were delivered. Probably the most noteworthy as it was the most thoughtful of these was that in English delivered by Mr Kanwar Sain, MA, Principal, Law College, on "some factors of Hindu union and disunion." Under the factors leading to disunion and disintegration the speaker enumerated diversity of beliefs, customs, languages, castes and sub-castes, dress, diet and habits, the absence of any common sacred book, the existing system of education which was either entirely secular, or even when religions was sectarian, and lastly the contact and conflict of Hindusim with the many other religions and ideals of the world. A truly gigantic list of factors which must inevitably leads to utter confusion, hopelessness and despair. The new Chief Justice of India, R.M. Lodha, who has a short tenure of five months. Mr Lodha's reasoning for sticking to the present system is that a fixed tenure for the chief would deny other equally qualified judges on the Bench an opportunity to fulfil their aspirations. It needs to be added that the new CJI will reach the retirement age in five months. However, all things considered, Mr. Sathasivam's proposal merits the most serious consideration and eventual acceptance. For the quick turnover of those presiding over the apex court is hardly conducive to reforms and changes for which the country is crying out because these need a stable leadership of the highest judicial team. 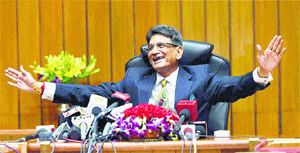 Mr Lodha is the 41st CJI during the 64 years since the Supreme Court's inception on the day the Constitution came into force on January 26, 1950. This gives an average of one-and-a-half years' tenure for the CJI, which is surely inadequate. In one case the CJI served for precisely 18 days. There have also been several other ridiculously short tenures, too. An eminent CJI took over just before the court's vacation and retired soon after the court reassembled. Now compare this with the state of affairs in the United States where the total number of chief justices of the US Supreme Court through its 238-year history is far fewer than 41. That, of course, is the result of a strange American provision of not having a retirement age for those appointed to the American apex court. It is up to every Supreme Court judge to resign whenever he or she chooses to. If this is very odd, then so is our inflexible adherence to seniority as the sole criterion for the selection of the CJI. As long as this persists the most senior Supreme Court judge is almost certain to be close to 65, the age of retirement. As a reporter I was witness to what happened when the time was nearing for the first CJI Harilal Kania to retire. The judge next to him in seniority was Patanjali Sastry. He had only a few months of service left. So Prime Minister Jawaharlal Nehru suggested that the judge just below Sastry in seniority should be made the next Chief Justice. All hell broke loose. No one protested more vehemently than Justice B. K. Mukherjea, who was being offered the job. Ironically, there came a time when, as a result of Indira Gandhi's confrontation with the judiciary, senior judges were superseded several times, and their juniors readily accepted the top job. Those superseded usually resigned. Isn't it time, therefore, to review all this? Or should advancement in every institution continue to be like riding an escalator? This said let me add that a fixed tenure for the CJI is not the only issue about the higher judiciary that needs urgent attention and action. There are quite a few other problems and matters that need to be taken up even earlier. An extremely important one is the question of judges' appointment and accountability. In their interaction with the media both the outgoing and incoming CJIs have stated that the present system of the group of most senior judges dealing with these matters was appropriate. There is widespread disagreement with this. The Congress-led United Progressive Alliance government had even a Bill ready for the formation of a mechanism for higher judicial appointments and for enforcing judicial accountability. The new government will have too much on its plate but that is no reason to delay a decision on this issue. Parliament also must be watchful. Of late there has been a spate of complaints across the country of kith and kin of judges practising in their courts in defiance of all established norms. The malpractice has acquired the moniker "Uncle Judge". In the case of the Punjab and Haryana High Court it was recently reported that the bulk of public prosecutors and other judicial functionaries were relatives of judges and Advocates-General. A parallel phenomenon that is no less deplorable has earned the nickname "Bench hunting" or "forum shopping". In simple English this means that many petitioners manage to get their case heard by a particular judge from whom they receive a favourable judgment. On one occasion one senior counsel created a sensation by declaring before a Bench headed by the retired CJI, Mr Sathasivam, that "Bench hunting" was rampant even in the apex court. He went so far as to name two Supreme Court judges who, he alleged, were involved in the racket. Mr Lodha blames the Bar councils for the spread of these unethical practices. He also says that the selection of better judges would automatically improve things. There is no problem as alarming as the colossal arrears of undecided cases. There are 56, 893 such cases in the apex court itself. In high courts and lower courts the number has soared to crores. Mr. Lodha has promised to set up three designated Benches to clear this mess. Let these fine words be translated into action speedily. My domestic help, a usually soft-spoken quiet woman suddenly became a garrulous harridan as the elections approached. On the voting day, she arrived early and with alacrity started the task of chopping vegetables for the day. She summoned me into the kitchen on a lame pretext and lifting the sharp vegetable knife in query asked: 'Madamji who do you think will become the PM?' I was nonplussed. My sleep-befuddled mind grappled with this question which was being argued vociferously on every channel. Before I could formulate a response, she brandished her knife and said: 'The corrupt netas should not be given a chance'. With unerring accuracy she cut through a mound of onions and wiping an angry tear lamented: 'They were responsible for the onion price rise'. I was impressed by her onion-drenched opinion and muttered in agreement. 'We will all vote for the common man', she announced. 'You must also vote for him. Give him a chance', she pleaded. I nodded feelingly. Encouraged, she went on 'the pradhan may have committed to voting for the party that hands out goodies but madamji in our colony we are all voting for the party that will uplift the common man'. My car-cleaner, dissented vociferously. He would vote for the party that had promised them houses. The cleaning lady agreed. But my domestic help would have none of this. She insisted belligerently that most parties were out to warm their pockets and would not think of the common man. Over two cups of hot sugared tea and mathi, she persuaded the dissenters to vote for the common man. The common man was no naïve fool, I realised. The next day my domestic help arrived with a satisfied smile on her face and zealously informed me that she had stood six hours to cast her vote along with everyone else in the colony. 'You know what happened yesterday madamji' she burst out merrily. All agog, I looked at her enquiringly. 'When I pressed the button of the EVM, it did not beep. It meant my vote was not registered. So I called the in-charge and made sure my button beeped'. She thought for a while and with all the sagacity of dyed-in-the-wool expert said: 'Maybe it was a deliberate ploy to hoodwink us'. My 'third eye' blinked in astonishment at the wise rhetoric. Now I know for a fact that the common man is no gullible simpleton but a hardened cynic who is empowered to fight for his rights. The China factor is all around and the Obama Administration is trying its best to get its act together in Asia after making a number of false starts. When Obama visited China in November 2009, he was at the height of his power domestically. He was dictating the contours of his domestic political agenda. The opposition was weak and diffuse. His administration had ideas about China as the fulcrum of stability in the Asia-Pacific. China's growing economic and political clout was forcing the Obama administration in early days to toy with the idea of a G-2, a global condominium of the US and China, whereby China could be expected to look after and ‘manage’ the Asia-Pacific. The Obama administration, however, was signalling that it was more interested in managing America's decline than in preserving its pre-eminence in the global order. There was no strategic vision about Asia apart from the hope that US and China could work together to sort out global problems. 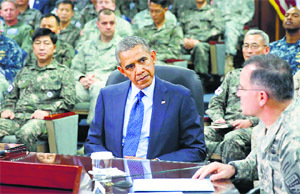 Today, it is a much-different scenario, one where China has started asserting itself more strongly than before, and Obama's latest visit to Asia was aimed at reminding China that the US still retains its role as the principle balancing force in the region.Regional states are worried about China's rise and its attempts in the recent past to assert its interests more forcefully in the region. There is a clamour for American leadership in the region, as none of the regional states want China to emerge as the dominant actor in the region. All want a stronger US presence in the region to confer greater stability. America's new diplomatic and military strategy is explicitly geared towards tackling the emerging threat from China's massive and rapid military build-up and growing diplomatic clout. It takes forward the already underway process of reorienting the American military might from the Atlantic to the Pacific. Where the new strategy is unambiguous, however, is in underlining the challenge in the Asia-Pacific and turning America's gaze to this geo-strategically pivotal region and to China's growing prowess. The US is re-ordering its strategic priorities. Nor will regional states allow America to lower its profile. After all, the elephant in the room is China's faster-than-expected ascent in the global inter-state hierarchy. But America's strategic rebalancing towards the region, popularly termed as 'pivot' has come under strain. The 'pivot' was Hillary Clinton's brainchild but his successor, John Kerry, had been sceptical of the 'pivot' strategy in the past and the nomenclature in Washington has already changed to “strategic rebalancing” since his taking over the role of America's chief diplomat.Moreover, America's economic problems and defence budget cuts have engendered an inward-looking foreign policy posture. The domestic polity in the US is not prepared to make any substantial commitments to maintain America's global supremacy. Obama's leadership has also been a problem as he has failed to make a strong case for America's global leadership. His diffidence on Syria and Ukraine is causing many US allies to question America's resolve in tackling the challenge of China's rise effectively. Yet, America's 'pivot' to the Asia-Pacific is viewed in Beijing as a policy designed to contain China and it has been criticised in the new biennial Defence White Paper as a policy that runs counter to regional trends and “frequently makes the situation tenser.” The US 'pivot' will lead to 60 per cent of US Navy's capabilities deployed to the Pacific by 2020. Regional states are looking to work together with Washington in operationalising this policy. Singapore will house four US Littoral Combat Ships and the Philippines will be hosting more US troops on a rotating basis. Around 2,500 US Marines will be deployed to the northern city of Darwin in Australia while Indonesia is seeking to buy significant military equipment and undertaking joint manoeuvres with the US. This is in addition to Washington's upgradation of its defence ties with its traditional allies in the region — Japan and South Korea. America has also taken a more activist role in territorial disputes in East Asia and South China Sea between China and its regional neighbours which has been viewed in Beijing as targeting China's sphere of influence. While Obama's latest Asia sojourn may not be enough to dispel all the apprehensions of America's continuing commitment to regional stability, it will go some way in assuaging regional concerns about Washington's foreign policy priorities. Ukraine and Syria are merely distractions as the real story of the 21st century will unfold in Asia and its where America will have to remain engaged if it is serious about its own global pre-eminence. These theoretical propositions gained applicability as President Obama winged his way through Japan, South Korea, Malaysia and the Philippines, countries enjoying cordial relations with the US but indifferent relations with China. Obama sought to reassure them of American support vis-a-vis China. And, dispel growing beliefs that Washington's “pivot” towards Asia has weakened due to its continuing financial crisis, war-weariness, lack of bipartisan support on the Hill, precipitate retreat from the Middle East and faltering over the crises in Syria and Ukraine. Washington's regional allies are concerned that Crimea could be a precursor to similar American inaction should China attempt a similar territorial grab in the South and East China Sea. China, naturally, is convinced that the US “pivot” towards Asia is designed to contain China and impede its expansion into the West Pacific and Indian Oceans. A pointer to the American strategy is the relocation of its naval and air assets from the Atlantic to the Pacific Ocean, increasing Marine deployments in Australia, and efforts to establish the 12-nation Trans Pacific Partnership (TPP) that stretches from Asia to Latin America. 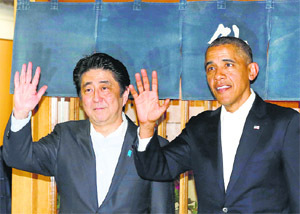 Little wonder that Xinhua criticised Obama's four-nation tour at its very start as “myopic” and intended to “cage” China through an “anachronistic hegemonic alliance system.” For his part, the Japanese Premier, Shinzo Abe, was anxious to ascertain the extent of Obama's commitment to Japan in its rivalry with China. In Seoul, Obama re-confirmed Washington's commitment to South Korea's security, which noted President Park's insistence that North Korea conducts no more nuclear tests. Seoul wishes to maintain the Korean peninsula as a denuclearised zone. China, however, has assisted Pyongyang's nuclear quest while casting itself in the role of a mediator. China hopes thereby to weaken the existing entente between the United States, Japan and South Korea in East Asia. In Kuala Lumpur, President Obama reaffirmed the American commitment to Southeast Asia while extolling the virtues of Malaysia's democracy. Obama's visit strengthened beliefs that the US sees Malaysia as a key Southeast Asian power in a region where US allies are disconcerted by China's fractious claims to preferential use of the South China Sea and sovereignty over its disputed islands. Placing US policy beyond doubts, Obama advocated greater security cooperation with Malaysia to ensure “freedom of navigation in critical waterways” and to ensure that nations “play by the same rules.” China could not have failed to get the message. A new defence agreement was signed before Obama's arrival in Manila, which would enable troop presence, besides US fighter aircraft and ships to be positioned in Filipino bases. Obama declared the US treaty-bound to defend the Philippines and supported its policy to seek international arbitration to resolve disputes, a process rejected by China. Is a clash between China and the United States inevitable? Their present asymmetries resemble those between Germany and the UK in the last century. The US, like the UK, is a status quo maritime power, whereas China, like Germany, is a rising continental power. Germany consolidated itself in the late 19th century by unifying some 38 small states and principalities: China emerged in the first half of the twentieth century as a Communist state after two hundred years of foreign dominance. However, the US lives in relative peace with its partners in the Western Alliance. But, China has embroiled itself in Asia's territorial disputes and nascent tensions and instabilities. China nurtures land border disputes with India, Vietnam and Mongolia, and maritime contentions with the littoral nations of the East and South China Seas, inspiring them to solicit the countervailing power of the United States. The conclusion is irresistible, consequently, that “co-evolution” between China and the United States is a myth. What the international system might witness, on the contrary, is another practical demonstration of the Thucydides trap. * Sino-Japanese relations have been embittered over the Senkaku Islands in the East China Sea. * They were bought by Japan from private owners but China claimed them on the basis of historical records. * Obama affirmed that this dispute fell within the ambit of the US-Japan treaty of Mutual Cooperation and Security. * The US supported Tokyo’s claim by using the Japanese name, Senkaku, for these islands, instead of Diaoyu, as called by China.